"You just don't know whether the noises you're hearing, whether it's people, whether it's police, whether it's terrorists, you just don't know what those noises are," said Simon Crump. 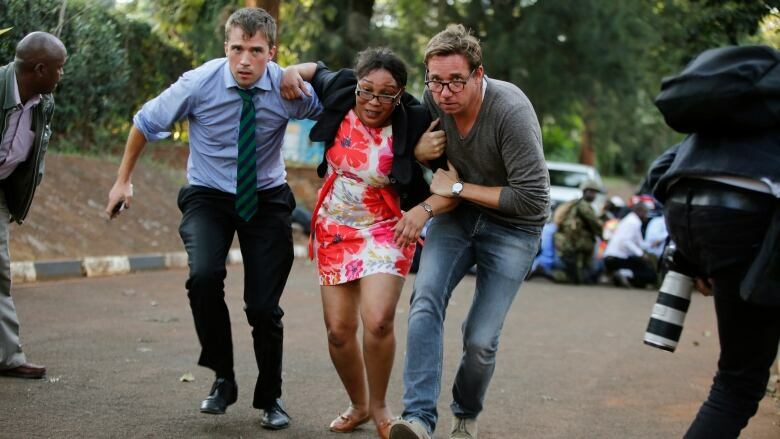 Simon Crump was working in his Nairobi office when he suddenly heard what sounded like explosions followed by a "quick succession of gunfire." He and his colleagues ran to the atrium to find out what was going on, and everywhere they looked, they saw "masses of people fleeing in panic." "The only thing that people said was, 'Run, get out of here, just go,'" Crump, an Australian who has been living and working in Kenya for five years, told As It Happens host Carol Off. He didn't know it at the time, but his office complex was the scene of a co-ordinated assault by extremists on Tuesday that police say began with an explosion that targeted three vehicles outside a bank, and a suicide bombing in a luxury hotel lobby. 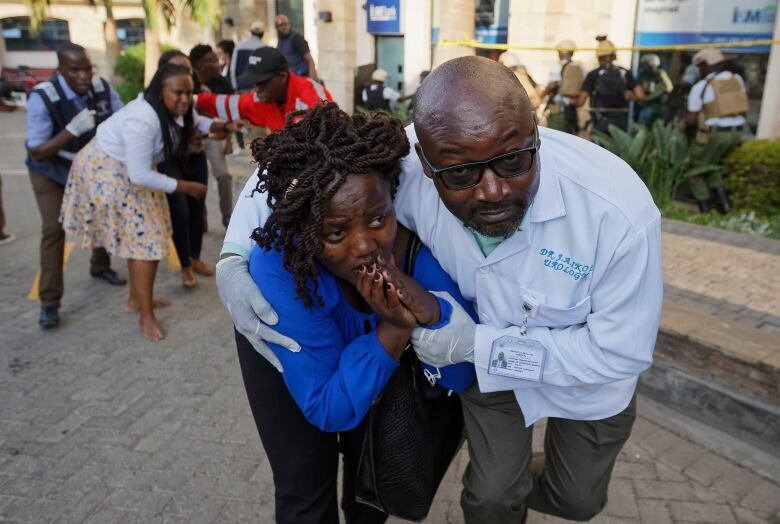 Al-Shabaab — the Somalia-based extremist group that carried out the 2013 Westgate Mall attack in Nairobi that left 67 people dead — has claimed responsibility for the attack that killed 14 people. Crump, hidden in his office Tuesday morning, was desperately texting people for information. He said could hear more explosions and "what sounded like powerful rifles going off" outside. But it was the noises inside that really scared him. "You'd hear footsteps above, you'd hear other things, other people moving around in the building," he said. "It's quite nerve-wracking because you just don't know whether the noises you're hearing, whether it's people, whether it's police, whether it's terrorists — you just don't know what those noises are." 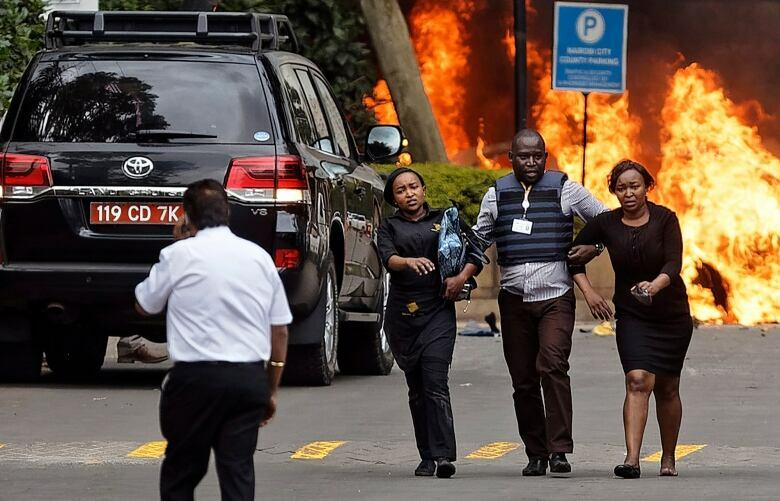 When Kenyan police finally showed up at his office door to help, he wasn't sure if they were who they claimed to be. He and his colleagues refused to open the door until they heard a woman a few offices down give herself over to police. The officers led Crump and his co-workers out of the building with their hands on their heads, he said. All the while, they could still hear gunfire. "I don't know where those shots were coming from or who they were coming from, but as we were leaving, it was definitely still very much active shooters around," he said. Crump is now safe at home. "I've been here five years, and obviously you're aware of the security issues and the fact that hotels and corporate office blocks and shopping centres are high targets, but I think we've had a false sense of security," he said. "I think what this will do is just remind people that there is a terrorist group in a neighbouring country that are hellbent on making people suffer." Al-Shabaab has vowed retribution against Kenya for sending troops to Somalia since 2011. The al-Qaeda-linked group has killed hundreds of people in Kenya, which has been targeted more than any other of the six countries providing troops to an African Union force in Somalia. Asked if he would remain in Kenya, Crump said he's still trying to process what happened. "I think it's too early for me to say," he said. "I think I'm definitely still coming down from the shock and adrenaline of the whole attack." Written by Sheena Goodyear with files from Associated Press. Interview with Simon Crump produced by Jeanne Armstrong.